You should be online. For some background on this, check out my guide on conducting OS fingerprinting with xprobe2. In my case, it is The advance in technology has made it easier for everyone to access the internet wherever they are, on whatever gadget they are using. Identity Theft Prevention for Job Seekers. Hello can you talk through Facebook. Using a hacking suite requires software and hardware with heavy configuration. Inside Kali OS , There are different hacking modules for different purposes. Aircrack-NG is the most widely used wireless hacking suite module in the world. It comprises of a complete set of tools that can be used for maneuvering and cracking Wi-Fi networks. Despite being the most advanced hacking suite, it is sometimes very slow in cracking passwords. To compensate the slow speed, researchers have developed another wireless hacking tool called CoWPAtty which is an alternative for Aircrack-NG but often hackers use both to get optimal results. By default your wireless card will only receive packets that are intended for it. But since you do not have access to the network, you will not receive any traffic data unless you convert your wireless card into a promiscuous mode. So the first tool that is being used is Airmon-ng , which will allow our wireless card to hook-up with traffic data, no matter it was intended for it or not. The next tool that is neing used is Airodump-ng , which enables us to capture packets that we are interested in. To be able to capture the encrypted password for this Access point, we need to capture the 4 way handshake authentication protocol and this is only possible when someone other client is in the process of authentication. To be able to achieve this scenario, We will first de-authenticate any client and allow them to authenticate again. So we use another tool called Aireplay-Ng to de-auth any user. Once we de-auth the client, he will automatically try to authenticate again and during this process out previous tool Airodump-ng will silently attempt to grab their encrypted password in the new 4-way handshake. Now that we have the encrypted password, we now attempt to crack it by using a password file Default password list included with aircrack-ng. Depending on the length of your password list, It might take a few minutes to a few days. Refer this tutorial on using Cowpatty — Wireless hacking tool. If you are using a normal PC to decipher the hashed password, it can take years to crack it. This is because of infinite possible combinations of characters. To simplify your job, You need a fast and reliable multi-core CPU. Given the infinite number of possible combinations for a password, you cannot process the software on a normal CPU. The cores in the CPU make difference. Opt for a multi-core processor before initiating password cracking process. You also require a powerful wireless adapter. But, it cannot be used for the hacking purpose. We cannot initiate our hacking process without the right wireless adapter. The adapter should be able to accomplish two tasks. First, it should work in the monitor mode where it can detect all the networks irrespective of the frequency. Secondly, it should be able to inject as well as detect all the packets in the air. Anyone listening can steal these cookies and then use them access your authenticated web session. This recently made news because a programmer released a Firefox plug-in called Firesheep that makes it easy for an intruder sitting near you on an open network like a public wifi hotspot to sidejack many popular website sessions. For example, a sidejacker using Firesheep could take over your Facebook session, thereby gaining access to all of your sensitive data, and even send viral messages and wall posts to all of your friends. Packet sniffers allow eavesdroppers to passively intercept data sent between your laptop or smartphone and other systems, such as web servers on the Internet. This is the easiest and most basic kind of wireless attack. Any email, web search or file you transfer between computers or open from network locations on an unsecured wireless network can be captured by a nearby hacker using a sniffer. Sniffing tools are readily available for free on the web and there are at least videos on YouTube to show budding hackers how to use them. A Netscape-defined protocol for securing data communications — particularly web transactions — sent across computer networks. The Secure Sockets Layer SSL protocol establishes a secure session by electronically authenticating the server end of any connection, and then using encryption to protect all subsequent transmissions. Because all wireless transmissions are susceptible to eavesdropping, WEP was introduced as part of the original It was intended to provide confidentiality comparable to that of a traditional wired network. Since , several serious weaknesses in the protocol have been identified so that today a WEP connection can be cracked within minutes. Working in high tech for over 15 years, Jared currently lives in Seattle with his wife, daughter, and their two cats. The future of privacy and VPNs are intertwined. Is your hotel decrypting your encrypted data? Is Public WiFi Safe? A New Tool to Deceive Hackers. Identity Theft Prevention for Job Seekers. Lessons to be Learned from Target. Thought Leadership Is your hotel decrypting your encrypted data? Thought Leadership Ask the Expert: Share this article Share. Share or comment on this article: Mother-of-three, 47, who screamed 'I'm going to kill you' Police launch appeal to find girl, eight, who vanished British priest, 72, put two policemen in hospital after Woman, 30, is arrested for brutal killing of 'friend of a Trump is mocked for saying Hurricane Florence is 'one of Children were killed by being swung against tree trunks, Two female mental health patients drown after rapidly Iranian father sobs in court as he denies taking The incredible story of little orphan bear who was saved Investigators probe abattoir after laughing workers are Rail passenger who was 'heavily with child' is 'told to Schoolboy, 13, with severe dairy allergy died after 'he Comments Share what you think. Apr 18, · Download an app for your phone like WiFi-Map (available for iOS and Android), and you'll have a list of over 2 million hotspots with free Wi-Fi for the taking (including some passwords for locked Wi-Fi connections, if they're shared by any of the app's 7 million users).Occupation: Features Editor. Evil Twin APs and Wi-Fi Honey Pots. One technique Wi-Fi hackers can use to get unsuspecting people to connect to them is by setting up a fake access point, aka an evil twin access point or wireless honey pot. It is very easy to crack. 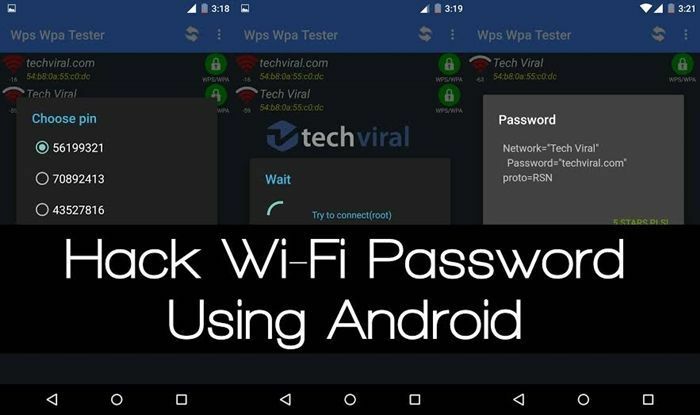 Generally, people do not understand the working of hacking WEP wifi but able hack it. There is an initialization vector send over all the network if you capture Initialization vector you crack WEP password.